Currently there are several special issues in “Data Envelopment Analysis Journal”, see details below. Abraham Charnes was born in Hopewell, Virginia, USA on September 4, 1917, son of Harry and Rebecca Charnes. (For details on his biography and scientific work see, Kortanek . See, also Philips , and Phillips, Seiford .) He died on December 19, 1992 in Austin, Texas at the age of 75. Dr. Charnes graduated in mathematics from the University of Illinois (Urbana-Champaign) in 1938, where he also received a master’s degree in mathematics in 1939. After that he received a graduate scholarship to study at Harvard, but this was interrupted by World War II. In 1942 he entered the U. S. Naval Reserve as an Ensign OV(S) and worked in electromagnetics, torpedo performance and control, supersonic flight, fire control, weapon damage assesment and did the first U. S. pro-submarine operations research. He returned to the University of Illinois where he received a Ph. D. degree in 1947. His dissertation was entitled “Wing-Body Interaction in Linear Supersonic Flow” (adviser D. G. Bourgin). In 1948/49 he began his post-doctoral academic career as an Assistant Professor of Mathematics at Carnegie Institute of Technology. At that time he married Kathryn Francis and began his lifelong collaboration and friendship with W. W. Cooper. Dr. Charnes also taught at Purdue and Northwestern Universities. At Northwestern he was the Walter P. Murphy Professor of Applied Mathematics. Professor Charnes joined The University of Texas at Austin in 1968. There he held the Jesse H. Jones Professorship and was a University System Professor. He was later named the John P. Harbin Professor in the College of Business Administration. He was also the director of the Center for Cybernetic Studies at the University of Texas at Austin. Professor Charnes was an internationally recognized mathematician, as well as one of pioneers and great contributors in operations research and management science. His fundamental contributions were in mathematics, statistics, engineering optimization, finance, marketing, and human resource management. He was a founder and president (1960) of The Institute of Management Sciences (TIMS) and also the editor of Management Science. He was a fellow of the American Association for the Advancement of Science and the Econometric Society. He published 434 journal articles and eight books. He was a finalist for the Nobel price in 1975. Professor Charnes was the recipient of numerous honors. Among these was the John von Neumann Theory Prize of the TIMS and the Operations Research Society of America (ORSA) in 1982, jointly with W. W. Cooper and R. J. Duffin, for their “fundamental contributions to optimization methods, concepts, and models for problems of decision, planning and design.” He also received the Notable Contributions to the Accounting Literature Award from the American Accounting Association, and the Harold Lardner Memorial Award from the Canadian Operations Research Society. During the celebration of his sixtieth birthday in 1977, Professor Charnes received the U.S. Navy Medal for Public Service, the Navy’s highest civilian award, for his contributions as a research physicist and operations analyst during World War II. In 2006, he was posthumously awarded the Institute for Operations Research and the Management Sciences’ IMPACT Prize jointly with W. W. Cooper for all their work on DEA. Professor Charnes is one of only twenty-three individuals to be elected into the International Federation of Operational Research Societies’ Hall of Fame as of spring, 2015. Charnes, Cooper and Rhodes introduced the basic CCR model of Data Envelopment Analysis (DEA) in their seminal paper „Measurnig the Efficiency of Decision Making Units“, which was published in the European Journal of Operational Research (EJOR) in 1978. Professor Charnes contributed in DEA as an author or co-author with many published papers in the theory and applications. Stability of the CCR model of DEA, proved by Charnes, Cooper, Sears and Zlobec, was very important for applications. He also was an adviser to many students who received Ph. D. degrees in a variety of areas including DEA. Professor Charnes was remarkable in many ways: a distinguished scientist, and professor, an adviser, a husband, and father, and a friend, who was ready to help anyone. I was fortunate and honored to do my post-doctoral research, as a Visiting Fulbright Scholar in 1985/86, under his supervision in the Center for Cybernetic Studies at the University of Texas. The results of our joint work on sensitivity analysis in DEA were published in six papers in Glasnik Matematicki and EJOR. Given the seminal contributions of Professor Charnes to DEA as well as many other fields, We will organize a session devoted to Professor Abraham Charnes on the occasion of hundred years since his birthday in the DEA2017 in Prague, Czech Republic, June 26 – 29. K. O. Kortanek (1980), „A Biography of Professor A. Charnes and His Scientific Work“, In: A. V. Fiacco and K. O. Kortanek (Eds. ), Extremal Methods and Systems Analysis An International Symposium on the Occasion of Professor Abraham Charnes’ Sixtieth Birthday Austin, Texas, September 13 – 15, 1977, pp. 2 – 9. F. Philips (1997), „In Memoriam Abraham Charnes, 1917 – 1992“, In: A. Y. Lewin and L. M. Seiford (Eds. ), From Efficiency Calculations to a New Approach for Organizing and Analyzing: DEA Fifteen Years Later, Annals of Operations Research, 73, 389 – 391. F. Y. Phillips and L. M. Seiford (2011), „Abraham Charnes“, In: A. A. Assad, S. I. Gass (Eds. ), Profiles in Operations Research Pioneers and Innovators, Chapter 18, pp. 325 – 342, Springer Science+Business Media, LLC, New York. The organizers of the 15th International Conference on Data Envelopment Analysis have the great pleasure of inviting you to participate in the DEA2017 Conference to be held at University of Economics, Prague in the Czech Republic, on June 26 to 29, 2017. The University of Economics, Prague (also called Prague School of Economics) is the leading economics and business-oriented public university in the Czech Republic. It is the largest and most selective university in the fields of economics, business and information technologies in the Czech Republic with almost 20,000 students in its bachelors, masters and doctoral programmes, and considered a top business school in Central Europe. In the beautiful city of Prague, DEA2017 plans to bring together researchers and practitioners interested in the development of the DEA methodology and its applications to performance management in both public and private sectors. Theoretical and empirical papers on DEA and related fields in efficiency and productivity analysis as well as performance measurement are invited. In addition to paper presentation sessions, panel discussions and keynote speech sessions, the DEA2017 provides a series of tutorials on the pre-conference day. We are also honored to announce a special issue of The Data Envelopment Analysis Journaldevoted to selected papers presented at the conference. More information about scientific and social programs as well as paper submission can be found at www.deaconference.com/dea2017. We look forward to meeting you at the DEA2017 Conference in in Prague, Czech Republic. We are deeply saddened to announce the passing away of Dr. Susila Munisamy on May 27, 2016 after a brave two-year battle with lung cancer. She made significant contributions to the International Data Envelopment Analysis Society as an editor of the Data Envelopment Analysis Journal and the organizer of the 12th International Conference on Data Envelopment Analysis. 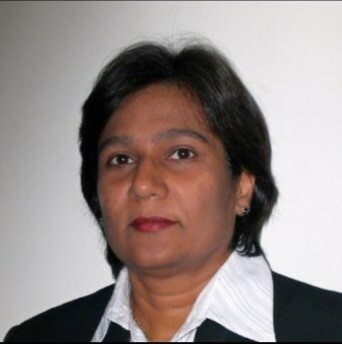 Susila was born on September 10, 1964 in Malaysia where she was educated, worked and lived most of her life. Susila was married in 1985 and was the mother of a son and a daughter. Her academic life started in 1990 when she went to University Putra Malaysia to earn her bachelor’s degree in Mathematics and a master’s degree in Operations Research. In 2004, she received her doctor of philosophy degree in business and industrial studies from Warwick University, England. Her life as a lecturer started in 1994 at the University of Malaya. She published more than 20 valuable papers and book chapters in the field of performance measurement and operations research, with a focus on Data Envelopment Analysis. In addition to teaching and research, Susila supervised several post-graduate students. She was the Head of the Applied Statistics Department at the Faculty of Economics and Administration at University of Malaya. She was promoted to the rank of a professor at the University of Malaya in 2015. I got to know Susila well in 2013 when she was designated by the International Data Envelopment Society as the local conference chair responsible for organizing the 12th International Conference on Data Envelopment Analysis at the University of Malaya in April 2014. In my capacity as the President of the Society, I worked closely with Susila. She took on broad responsibilities and discharged her duties with diligence. I was most impressed with her enthusiasm and dedication, and how competently she handled all the details of the conference. She was a conscientious human being and a humble and approachable person. She showed her ability as a leader as well as a team player to accomplish the tasks effectively. The conference was a success well beyond the expectations of the Society. Sadly, she was informed of the onset of cancer just a couple of months before the conference in 2014. She decided she would continue the organizing of the conference, postpone the more aggressive treatment and not let the cancer affect her work. She did not tell me about the diagnosis until the end of the conference. It is these qualities that will make her passing a big loss for the Society. I am deeply saddened to report that Professor William W. Cooper passed away early in the morning on Wednesday, June 20. He was a giant in the fields of operations research, management science and economics — and, especially in Data Envelopment Analysis (DEA) that spans all those disciplines. He had a great life making so many important contribution to so many fields, and of course he was the father of DEA. In a sense, an entire era ends with Bill Cooper, but he will be remembered for a long time because his intellectual ingenuity will continue to breed new knowledge in those that follow him. For those of us fortunate to have known him over the years it will leave a huge void in our lives. He was always so generous with his time and so full of new insights. Many have benefited enormously from Bill’s munificence manifested in his personal attention and initiative in not taking no for an answer and sometimes making the impossible possible. Born on July 23, 1914, Bill Cooper grew up in one of the roughest neighborhoods of Chicago. During the tumultuous times of the Great Depression in the 1930s, the responsibility for supporting his family fell on young Bill’s shoulders. He dropped out of high school to earn a living as a prizefighter boxer, losing only three of his 63 professional bouts. His career as a prizefighter, however, instilled in Bill the qualities of persistence and determination that enabled him to accomplish many challenging objectives in his academic life. Continuing on to studies at University of Chicago and Columbia University, Bill learned to settle arguments with incisive arguments rather than with his fists, and he was equally effective. 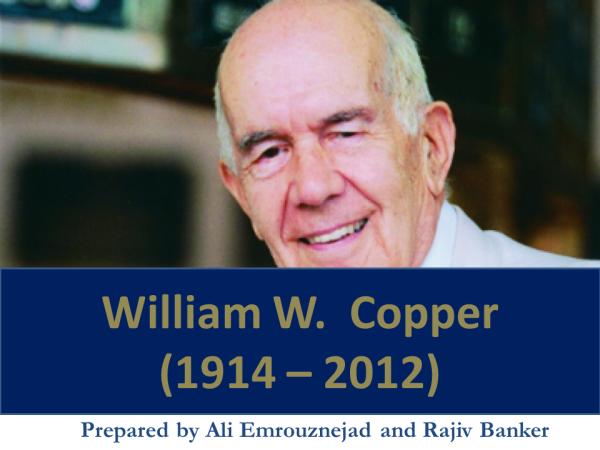 Throughout his career, Bill Cooper espoused the need for problem-driven research. He recognized the need for management researchers to be closely connected with the problems faced by managers in contemporary organizations. To Bill, this did not imply simply applying existing models to solve problems that fit those models. Rather, the objective is to identify new and challenging problems that require original solutions, motivating new basic research and the development of new models to address these problems observed in the field. Such research not only results in improvements in existing management practice but it also substantially enriches intellectual inquiry with the introduction of new problems, models and solution methods to the research literature. This is a tradition that has guided us in DEA research ever since its inception and led to its development as a rigorous method that is useful for addressing so many management and policy problems. This is a bolg of the International Data Envelopment Analysis Society. To post to this blog you need to register and login.